Our first introduction to the evil Galactic Empire began in the stars over Tatooine, as a monumental starship, a star destroyer we would later learn, paralyzed and then figuratively devoured a rebel corvette. Our second introduction was a door blasting to smithereens and white armored stormtroopers pouring through an opening concealed in smoke and blaster fire. In direct contradiction to the rebels, whose faces we saw, many of them seconds before painted with expressions between fear and resolve, the Empire’s soldiers were anonymous, hidden behind large black insect-like eyes and a permanent angry frown. That their leader, clad in black and equally helmed, was just as other worldly only added to the fearsome exoticness of the Empire’s rank and file. It seemed then in the beginning that the Empire, with the sole exception of its leaders, were meant to be something akin to drones, faceless and nameless soldiers dehumanized by an industrial war machine hell bent on ruling the galaxy. Except, in the very same film, A New Hope, a curious script decision began a process of doing the reverse. After Obi-Wan Kenobi, Han Solo, Chewbacca and Luke Skywalker, successfully evade a boarding party on the Death Star, the group makes a decision to split apart. Han, Luke, and Chewie, go to find and free Princess Leia (aided by wearing the anonymous storm trooper armor) and Obi-Wan rushes off to deactivate the battle station’s tractor beam. It’s Obi-Wan’s part of the adventure we now look upon. The film cuts to a pair of Stormtroopers stationed to guard the understandably important controls to the tractor beam. Shortly thereafter, Obi-Wan appears and uses the Jedi mind trick to confuse the Stormtroopers into chasing after a sound outside of the room. It’s the moment before that in which we watch and realize that there’s more than just mindless drones under the armor. How this happens? The Stormtroopers chitchat. 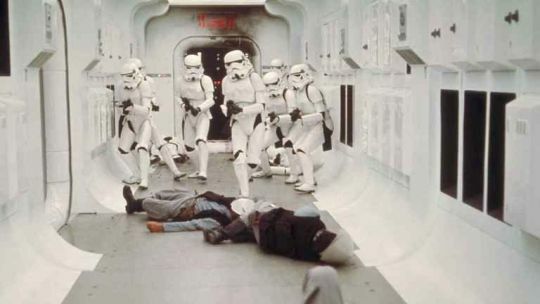 Perhaps the scene felt oddly quiet to George Lucas, but in a scene where no conversation was truly needed, Lucas had one trooper ask the other if they knew what was going on. It’s an extremely short conversation, but the image of the Stormtrooper was altered in that split second. The Empire’s legions were filled with people who questioned the world and grumbled about drills, not very different than the fans in the movie seats. The rest of the original trilogy failed to pick up on this aspect of the Stormtroopers, leaving only purely professional conversations and reactionary exclamations in The Empire Strikes Back and Return of the Jedi. Nonetheless, the door was opened and was actually reversed across the run of the prequel trilogy and The Clone Wars television show. The Phantom Menace had veritably no human soldiers, but could not avoid giving its droids, literally capable of being built to be robotic drones, personalities. However, almost all droids in the Star Wars galaxy have personalities, so jumping ahead to Attack of the Clones, we have the next best thing: Clones. Genetically identical, raised and trained for war in the same environment, and above all else, dressed in armor intended to invoke the spirit of the Stormtrooper. Clones should have been the ultimate military automatons, designed purely for one purpose, and in the films, voiced by the same actor to replicate the idea of their lack of uniqueness. In fact, for a certain time period, the old Star Wars Expanded Universe considered the idea that Stormtroopers were, in fact, clones, because of how well the idea matches up with the intention. The façade of factory stamped soldiers, fleshy meat puppets handed a gun and pointed in a direction, collapsed with the debut of The Clone Wars television show a few years after Revenge of the Sith (a film we will return to shortly). In The Clone Wars, multiple episodes draw upon the clones’ own quest for identity, from rejecting their technical numeric based names for nicknames, to altering their very appearances to separate themselves from their brothers. This idea of unique clones would have accumulated, had the show not been cancelled in a storyline about the ‘Bad Batch’ a group of clones who turned out radically different than the others. 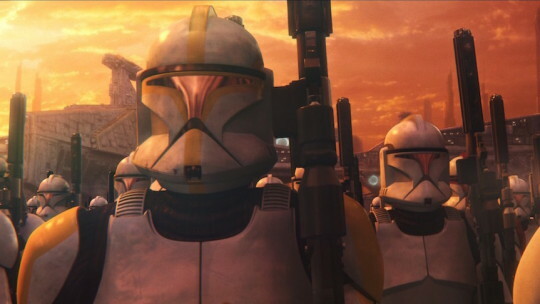 Regardless of the might have beens, by the end of the series, the clone soldiers in general had successfully come to distinguish themselves as individuals. This feat made the final act of Revenge of the Sith so much greater and darker, due to Order 66. As revealed in The Clone Wars, Order 66, given by the Emperor, activated a mind control chip in the brains of the clones. The result was a drone-like response to turn on their former friends and commanders, the Jedi. In the utterance of an order, the individuality of the clone troopers was wiped out. The idea of humanizing the enemy is a long held one in popular culture, and reversing that formula for the clones was not the last time it occurred since Disney’s acquisition of Lucasfilm. Under Disney’s watch, the trend has actually grown more prevalent. The best starting point to see it happening are in the new series of Star Wars novels, ranging from the time period of the original trilogy right on up to The Force Awakens. In Battlefront: Twilight Company, a fantastic novel by Alexander Freed, a series of chapters are dedicated to a young woman on Sullust who joins the Empire initially just for a paycheck and slowly becomes absorbed into the military culture. While the character’s evolution as a Stormtrooper changes her, it never erases her individuality – simply her perspective on the world. A better example can be found in Claudia Gray’s Lost Stars. 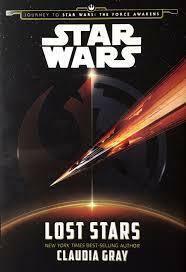 In Lost Stars, we are dragged straight into the Galactic Empire’s military apparatus by following the lives of Thane Kyrell and Ciena Ree. Both join the Empire, viewing it initially as a beneficial entity, and enter one of the Empire’s officer academies. Over the course of the novel, virtually every character we meet and come to know is an Imperial, including one or two who are killed when a certain X-wing pilot drops a bull’s eye on an exhaust portal of the Death Star. Lost Stars thrives on humanizing the Empire’s countless soldiers, pilots, and officers, even when they begin to possess the very traits which label them the bad guys. The growing fascination of stripping away the lack of identity even became a centerpiece of The Force Awakens. Moving past the aspect of removing our pseudo-Darth Vader’s helmet in Kylo Ren, we have FN-2187. A First Order Stormtrooper, FN-2187, for those who may not recall, is the hero Finn’s number. Just like the Empire before it, the First Order dehumanizes its soldiers, providing them names and anonymous uniforms (TK-421 may be the first Stormtrooper number we learn in A New Hope). But, in the first moments of the film, one of those soldiers is shot (possibly by Poe Dameron) and falls to the ground. A very human bloody hand reaches out to Finn for comfort, visually reminding everyone that there are people inside the white shells. Then, as we all know, the death of his comrade pushes Finn to desert the First Order. Jumping back into the novelized Expanded Universe, we have Before the Awakening by Greg Rucka, a series of three short stories about Finn, Poe, and Rey, set before the events of the film. In Finn’s short story, we see a lot of the same drive for individualization among the First Order Stormtroopers as we saw among the clone troopers. Finn belongs to a squad of soldiers, each with a nickname (ironically, Finn is the only one without such a moniker). Through Finn’s story, each is given a personality to match their nickname, and we even learn the name of the unlucky Stormtrooper felled in the opening minutes of The Force Awakens. Throughout The Force Awakens, subtle hints are provided to make those Stormtroopers become more than the automatons that their training might otherwise suggest they should be (trained from birth, General Hux proudly proclaims to Kylo Ren). 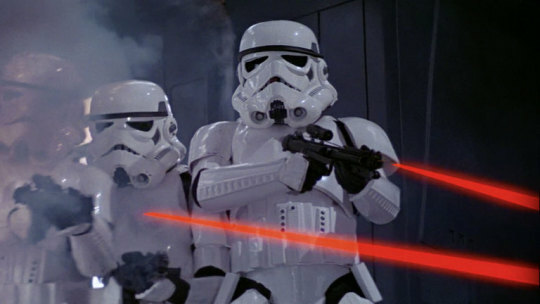 Two Stormtroopers react to seeing evidence of Kylo Ren’s rage by pirouetting and walking off in the opposite direction, while an officer in the command center of the Starkiller Base blatantly and loudly announces he’s saving his own skin as the planetary weapon begins to erupt into lava spewing pieces. “Maybe it’s another drill…,” are innocuous words meant to fill the silence of a scene, perhaps, but also words spoken by a person under the menacing white armor of a Stormtrooper. The humanizing of the enemy in Star Wars began in A New Hope innocently enough and reached its conclusion by making the enemy a hero in The Force Awakens. Is this a bad thing? Not at all, because war is the final result of political failure and in franchise which embodies its name, it’s best that we remember that people die on both sides of a war. After all, as one green Jedi Master put it, “Wars not make one great,” hardly a ringing endorsement.